Up until now our son has only had foundation academics. He does not yet read nor write. He has only recently begun to have an interest in holding a crayon/marker/pencil, uses a full fist grip, and scribbles, pressing very hard. If corrected, he will maintain the grip we show him, but it’s very challenging for him to do anything but scribble back and forth, or in circular motions. In the past year, though, he has started to show a growing interest in reading. We call this “readiness”. He points out letters and numbers whenever he sees them on signs or cars. 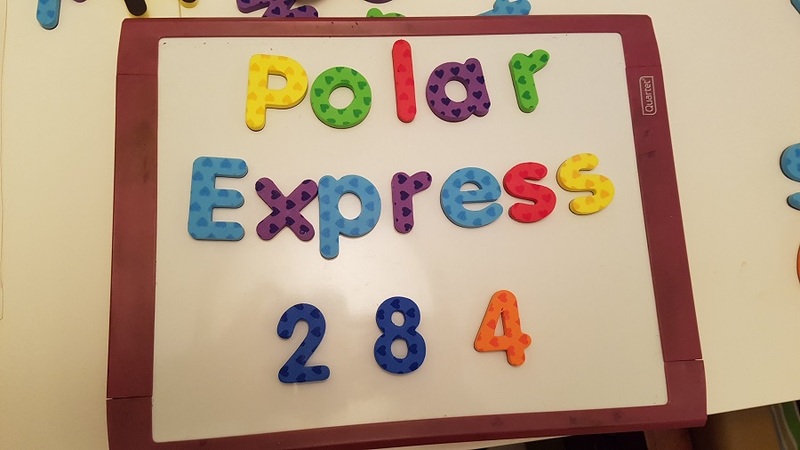 He’s had some introduction to literacy at school where they have cut out big letters, one here and there, to focus on recognition, and have helped him finger-write letters in shaving cream. Most recently, his desire to spell has become quite intense! This week, I begin to document our attempts at teaching him to read. 9/12: He took part in an activity that helps to improve his ability to recognize letters. The children had to match the letters given to them to the letters on the wall. He needed a few reminders to help him stay on task but did an amazing job and completed his part. 9/26: We worked on forming the letter A in shaving cream and sand. He was excited to play with shaving cream and specifically asked to write letters in it! With support he is able to write some letters in shaving cream by following my finger. During assessments I noticed that he had a hard time identifying lowercase letters, so today we practiced the letter “a.” I will continue practicing the letters (one or two at a time) until he is able to identify them in books and will then move on to practicing others. I found that writing them together and saying “Mama ‘A’ and baby ‘a’” really helped. 9/27: He requested to write names in shaving cream which made for a great opportunity to practice identifying lower case letters! 10/5: He is beginning to show an interest in writing letters. He often asks me to write names of teachers and friends on paper or on the wall with shaving cream. He is also willing to let his teachers provide him with hand over hand support to write them or he sometimes prefers to hold the teachers hand. Long ago I worked with early literacy experts for five years. I managed the data for all of the school districts in the state, and worked with regional Teacher Leaders showing them how to use their data to inform the implementation of the Reading Recovery program in their school districts. I even audited an entire year of Reading Recovery Teacher Training to learn about the program. I still have my training books, twenty years later. Needless to say, they were the first people I e-mailed to ask how best to proceed with our son. “Have you ever taught kids like our son who can’t sit still for more than a few seconds and have a very low attention span? Did you make any progress with them?” The answer was, “Yes!” So, I found a trained and experienced Reading Recovery early literacy expert to help us out! Reading Recovery is a one-on-one, individualized, developmental approach to reading, typically for first graders in a public school setting who are falling behind their classroom peers. Reading Recovery is in line with DIR/Floortime in its philosophy in that it is developmental, individualized, and follows the child’s interests. It is obvious that your son has good control over verbal language. That stands him in good stead for learning to read and write. It would seem that his biggest challenge is attention. He will require a very knowledgeable Reading Recovery teacher who is able to contingently respond to him, follow his lead and build on his strengths. I don’t know of any other initiative or approach that would meet his needs to the same degree as Reading Recovery would. Most approaches that will be available will be commercial products that focus on skill building. This is also the same approach favored in many special education settings. In my experience, children like your son work most successfully in Reading Recovery where the instruction is 1:1 and focuses on building literacy processing strengths within the context of continuous text. The key to success is focusing on continuous text in reading and writing (using real literature and composing real stories at the right level for the child’s level of understanding and problem-solving competencies). Helping your son understand the component parts (anticipated meaning, patterning of language/structure, and letter/sound relationships) at his point of need as you help him learn how to approach, understand and compose texts is what is required. This is not an easy journey, but if you can access the expert help you need (a really good, insightful RR teacher who understands and responds to his individual needs) you will have the best chance of success. What we are doing with our son is not a typical Reading Recovery program, which begins with an assessment that our son is not yet developmentally ready to have. We are simply using developmental concepts and ideas of the program to begin introducing our son to reading and writing. When he is ready, we might look at a more formal program. I shared all of this information and some videos with our early literacy expert prior to our first visit. On October 12th, she sent us a book that she made pulling screenshots from this Floortime video from this blog post of my husband and son popping water balloons. She transformed them into line drawings. The idea was to simplify the picture so that the attention to print can more readily be harnessed. Our first visit with our early literacy expert occurred on October 6th. She brought a small magnetic board with letters that spelled our son’s name and “Dad”. She started by spelling his name and asking him what it said. He knew and responded. She then jumbled the letters to see if he could spell it. He seemed to ignore that. She spread the letters out to see if he know that letters make a word. He put them back close together, unprompted. Next, she took off the last letter of his name. He put it back. She took off the last two letters and he put them back, but in the wrong order, and one of the letters was turned around. Then, she wanted to check his book handling, so we looked at the Balloons Go Pop! book together and he loved it! Make his name with magnetic letters. As you build his name say what letter comes first. Invite him to help with the sequence. Say what letter comes last. Eventually jumble the letters and invite him to build his name. Turn it into a game by having him race (you build his name and let him build his name at the same time). When reading ‘his’ story, ask him to find his name. Make his name on a large piece of cardboard. Cut it into 2 or 3 large puzzle pieces. Ask him to put it together again. Edge him closer to finding other words in ‘his’ story (e.g., which word do you think says ‘Dad’). Make ‘Dad’ with the magnetic letters. 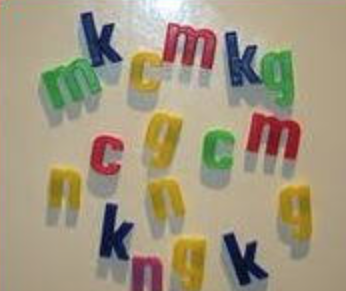 On a magnetic board (standing at the fridge will help), place multiple copies of the letters in his name in an array, as shown in the example. Ask him to find all the ‘m’ letters, then the ‘c’ letters, etc. Eventually add new letters to the array (e.g., D and a from “Dad’). Read simple books to learn that words are permanent, are represented by what are likely to be clustered squiggles to him, and that written language goes left to right and top to bottom. As you read, demonstrate pointing and matching. Pause so he chimes in at appropriate spots (e.g., last word in a phrase). Start to draw his attention to other words that start with the same letter as his name. We followed up on these suggestions by working on drawing attention to first and last letters of our son’s name and other words. We read the balloon book and some other little books our early literacy expert lent us, focusing on pointing to each word, and using hand-over-hand to help our son point to each word. The little books were very simple in structure and repetitive, following the intuitive language that our son would naturally use when looking at the book’s pictures on each page. We also focused on reading the little books from start to finish, rather than letting our son randomly flip through the pages. Learning about the beginning, middle, and end, in general, is one of the aspects of the fourth functional emotional developmental capacity where children understand there’s a start, middle, and end to a game as motor planning and sequencing improve. So this made a lot of sense to me to apply this principle in reading. The point is not that our son is reading. He clearly is not. But he is beginning to be introduced to the structure of language with words, sentences, and stories. It’s simple an introduction to the process. It is also clear that his engagement is not robust when we’re not following his interests, and the semi-structured activity becomes a bit of a chore for him. Once we make some books ourselves about his trains and experiences with trains, we imagine he will be far more interested! I hope you will find following our progress helpful. If you enjoyed this blog post, please consider sharing it on Twitter and Facebook via the links below, and if you have any constructive comments or reading experiences to share, please feel free to share them in the Comments section below.